If you’re not yet at the advanced level then chances are that you need to get to work on getting rock solid on the fundamentals. 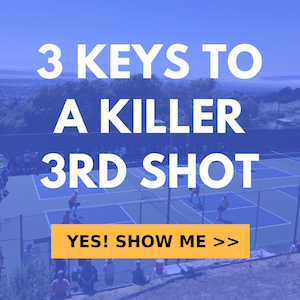 Strong dinking, consistent third shots, deep serves & returns, patience and strategy. It’s important to spend 99% of your drilling time on these key shots. But every now and again it’s fun to mess around with some new and advanced shots like the one we cover here. The forehand misdirection is advanced. It’s also fun and super cool when executed well. Have a little fun with this crazy shot but don’t spend too much time with it. It’s more like ice cream than the meat and potatoes of pickleball. It’s a fun shot to have in your arsenal because they will never see the attack coming. If done right, you’ll probably win the point.